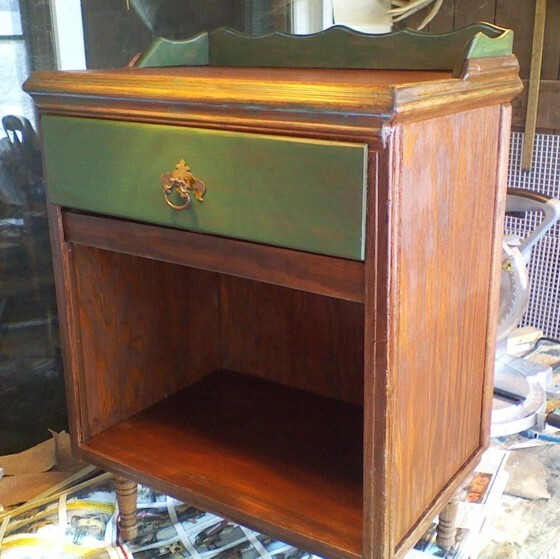 Joy Davis had an old night stand that wasn't quite right. So she decided to restore and refinish it. Here's her story. If you pay attention during her story you're going to be inspired. With a little work and effort, she transformed something with little utility to something that works quite well. 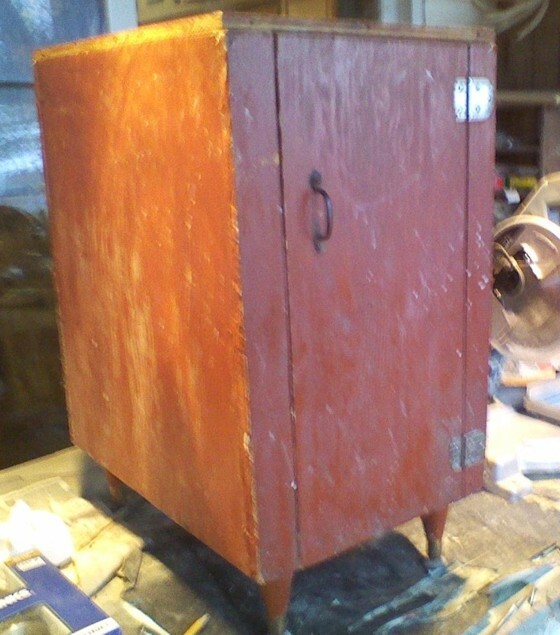 "I had an old, not pretty, night stand. I used it for many years. It was ugly so I kept it covered. It had a shelf inside the door and was deep so it was inconvenient to get to the stuff in the back, and I had to get on my knees to see back there. So recently, I decided to redo the night stand. I took it all apart and sanded it down and put it back together without the shelf, and added an old drawer that was laying around. I had to shorten the drawer but it worked. I added trim left over from other projects. The only thing I bought was a set of new legs. The old ones were fine but I wanted the stand to be a little taller, so I got legs that were 2-inches taller. My husband loves it now." My guess is Joy didn't have lots of expensive power tools. She just thought it through and did it. After all, what's the loss if something didn't go right? All she had to do was look at other furniture and COPY what that builder did to make what she wanted. A person can make a project as complex as they wish. this old night stand was given to me years ago. I decided I should either do something with it or throw it away. I spent hours sitting and staring at it. I drew pictures of it. It was my first remodel. I took it to my tiny make shift work shop on my back porch. I was scared ( what if I mess up? I thought) Then I realized that it was junk anyway so if I ruined it, no big deal. I took it apart. Now I do not know exactly what the difference is between remodel and rebuild. Is there a certain number of nails that can be removed before it is called a rebuild instead of a remodel? Anyway I said in my description that I took it apart, which I did completely. However I did not change the size at all. I used the left side panel for the new right end and I left out the old door and the shelf that had been inside. I did not even try to straighten out the crookedly cut base. I just put it back together like it had been except I did not put a left side on it which totally changes the appearance as the left side was now the front. These pictures are not of the same piece of furniture. Yes they are. Look again. Mike Kelly, I do not know if furniture is even an accurate description for what the night stand was before I did the make over. It was just a piece of junk that we had used beside the bed to hold the lamp up off the floor. I save everything. so I saved pieces of stuff from my kitchen remodel. When I decided to try to make over the night stand I used the left over kitchen stuff to decorate the night stand after I put it back together. I cold have left off the scalloped decoration off the top. I could have left the shelf inside and not added the drawer. But I just decided to try it. The drawer was out of an a little old desk that was long gone. I do not even know why I saved the drawer, but it was just the right width. This project was a huge amount of work to "save" a piece of junk. but what I learned and the praise from my husband and others is worth it. The fact is that I would have to pay a lot for a piece of furniture that looks like the final product. I saved money that would have had to come from our budget, I used left over junk that most people would have thrown away and I learned a lot. I'm having a major problem viewing your postings and your links on my I pad. Is there something I have to do to correct this. It seems that all the advertisements take over the page. Well, do you have the same problem looking at different pages on my site? Go above and click the center Q & A icon. You'll get a listing of other columns. Click through and look at several. Sometimes columns that don't have lots of words get weighted with too many ads. The ads SUPPORT this site and allow me to give you the content for FREE. I'm hoping that you can tolerate that since it costs you nothing to get all my information. I liked the before, but the after is incredible! You're a very talented lady. Great job, Joy! Very nice! No standing on your head to fetch anything now!